Cadets, parents, and alumni of the Virginia Military Institute are speaking out after the Washington Free Beacon's exclusive report that the prestigious military academy is offering students coloring books to deal with stress. Many were outraged at the Free Beacon's report, while others were equally bothered that the school would have coloring books for cadets in the first place. 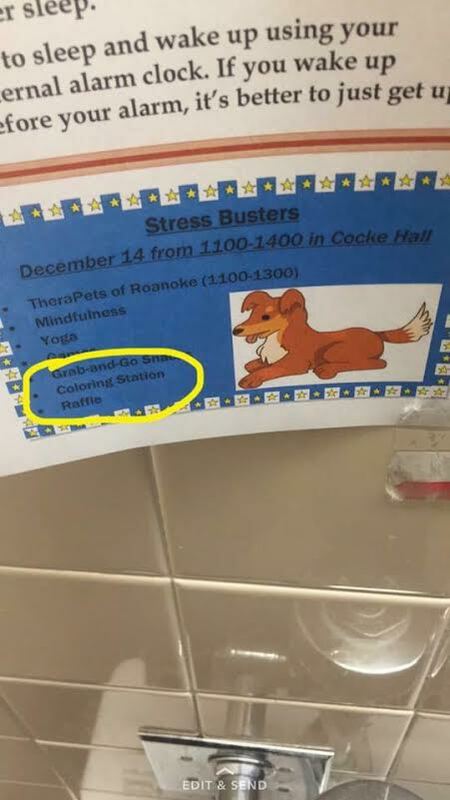 A new photo obtained by the Free Beacon reveals a flyer posted at VMI advertising "Stress Busters" with a cartoon picture of a puppy. The event for cadets, which occurs twice a year before finals, will include Therapets of Roanoke, the new-age meditation technique known as "mindfulness," yoga, games, grab-and-go snacks, a coloring station, and a raffle. One cadet currently enrolled told the Free Beacon the idea of offering coloring books for stress was an "embarrassment." "We pride ourselves on being one of the hardest schools in the nation," he said. "Current pressure from the state and outside population has tied our hands and forced us to make many changes in recent years." "These changes, including the ‘Stress Busters' program are resented and opposed by the majority of the cadet body," he added. All students and alumni interviewed for this story spoke on condition that they not be named. A 2010 VMI graduate echoed the sentiment, saying coloring book stations were "embarrassing and shameful." "If you cannot deal with the stress of exams, I can guarantee you will not be able to lead soldiers in combat," he said. "This type of crap is setting these cadets up to fail in the military and the real world." A group affiliated with the Citadel, the military college of South Carolina, antagonized its rival VMI on Facebook with a post that read "is this how you learned how to draw?" Others said the report was unfair, though it only detailed what VMI publicly stated on its website. Following the report, the school removed all references to coloring on its "Cadet Peer Educators" page. VMI has not responded to requests for comment. Some cadets and parents stressed that unlike other schools that offered "safe spaces" with coloring and puppies for students after the presidential election, VMI set up a boxing ring. They said the school is one of the toughest in the nation, with its notorious "Ratline," a boot camp like program that subjects new cadets, or "rats," to vigorous training, and strict regulations. "I haven't experienced any of those such things mentioned [in the article]," said one first year cadet. "The alumnus quote was ridiculously preposterous as well. I have never matured so much in so little time in my life. If anything I came in as a teenager and will come out a man." "I highly doubt many cadets will be partaking in much coloring," the cadet added. A Cadet Peer Educator, the group that hosts "Stress Busters," said the event is just a studying day and defended the use of coloring books, citing science. "We provide things like therapy dogs, yoga, general exercise, games, coloring books (which have been proven by several scientific studies to relieve stress in adults), snacks, and general info on studying and stress," he said. "A lot of the cadets seem to like it, as it's a nice break from the usual stuff. I support programs like these because I know how stressful it can get, and I've seen what stress can do to people, so I believe that I can really help people through this." 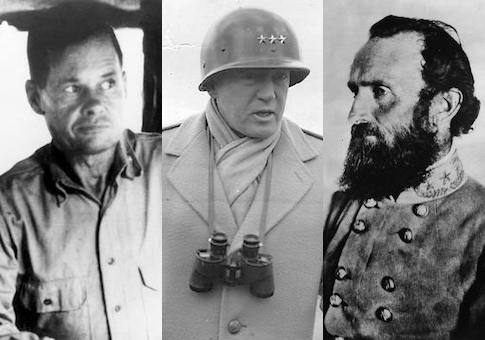 One VMI grad, who is now a First Lieutenant in the U.S. Army, said the reporter was "probably some old fart on a tirade to find every which way to complain about ‘those darn wimpy millennials. Back in my day….'" The Facebook group VMI Family, whose members include relatives of cadets and alumni, was also outraged at the report. "Sounds like an outsider who doesn't have a good understanding of what goes on…" said one member. "OMG! That is not the case," said another. "Cadets pride themselves on not needing coloring books or therapy dogs!!" "Perhaps [the reporter] could participate in a sweat party," another member said. "I'm sure they didn't offer those at her college." Another alumnus who currently has a son enrolled at VMI said the school is now "more physically demanding" than in years past. "VMI is doing as good a job or better in following their mission, which is to prepare citizen soldiers," he said. "We as alumni should be proud."